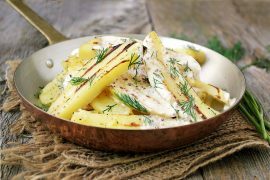 These Garlic Aioli and Parmesan Fries are a super simple way to dress up your plain fries and a must-try for garlic lovers! My sister lives in Toronto, so she has infinitely more restaurants to explore than I do living in a small town. She’ll often tell me about some of the delicious dishes she’s enjoyed and she knows enough to provide lots of details. I am, after all, a serial re-creator! 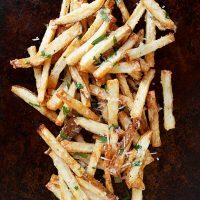 No matter how you make your fries (baked, fried, fresh-cut or frozen), the simple addition of a toss in garlic aioli and Grano Padano (or Parmesan) cheese will take your fries to a whole new level and are a perfect side for whatever meat you’re cooking on the grill! For these, I went with a cheater aioli that is basically dressed up mayonnaise. 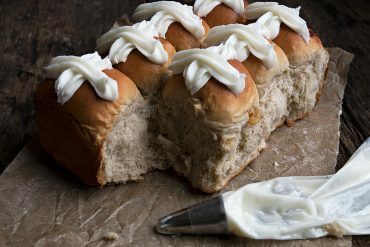 You can certainly make your own aoili, from scratch. There are a ton of recipes on the internet. But we’re talking about fries here and I thought cheater would be just fine. The garlic aioli is drizzled on the hot fries, tossed, then sprinkled with the Grano Padano and tossed again. I added a bit of chopped flat leaf parsley, just for colour. The garlic aioli basically melts in to the fries, giving them great garlic flavour. The grated Grano Padano sticks to the moist fries and coats them with cheese. If you’d like, you could also drizzle more over the top of the fries for more creamy garlic goodness. P.S. I’m starting a monthly newsletter! It’s going to have exclusive recipes, tips, tricks and who knows what else. My first newsletter is scheduled to go out September 1, so if you subscribe now, you’ll be able to get the first one in a few days. 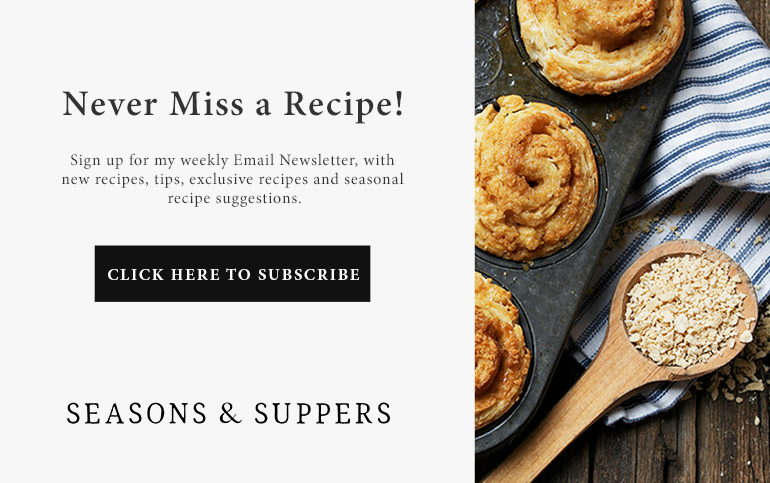 Look for the Newsletter Subscription box about half way down the sidebar, so if you are reading this in your email or feed reader, hop on over to the site and you’ll find the subscribe box in the sidebar! 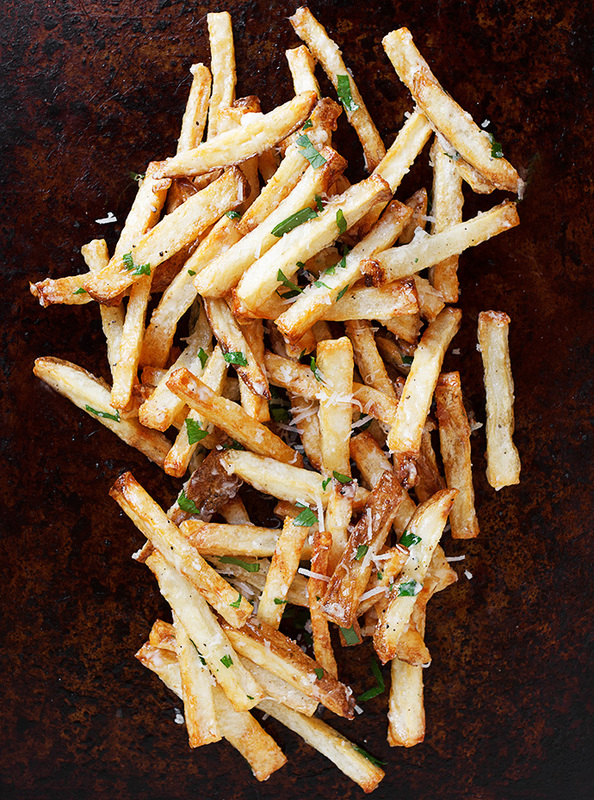 Hot fries, tossed in a quick and easy garlic aioli, Parmesan and herbs. 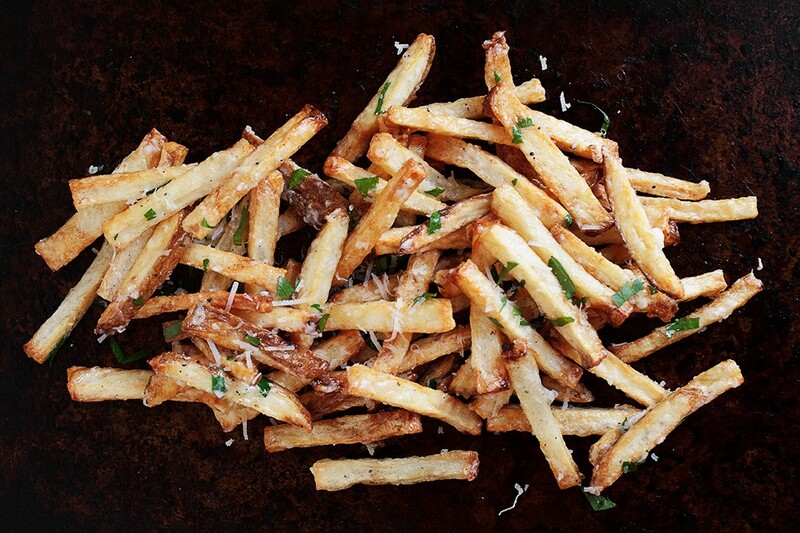 A great way to dress up your plain fries. While fries are cooking, prepare the Cheater Garlic Aioli by combining all ingredients in a small bowl. If it's a little too thick, you can add a small splash of milk to thin. Cover and let sit until needed. If making ahead, cover and refrigerate. Have ready your grated Grano Padano or Parmesan cheese and chopped parsley, along with a large bowl. Once your fries are cooked and while they are still really hot, place fries in your large bowl. Drizzle with some garlic aioli and toss to coat the fries. 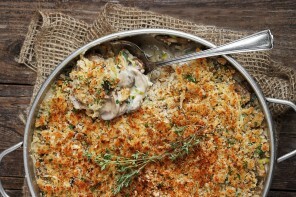 Sprinkle some grated cheese and chopped parsley on top and toss again. Sprinkle with a bit of salt (remember, the cheese is saltand lots of freshly ground pepper. Transfer to a plate. If you like, drizzle a bit more garlic aioli on top and/or a bit more grated cheese. You can also serve any left-over aioli on the side for dipping. Oh my gosh, these look marvelous! My boyfriend would love them – can’t wait to try them! Just come over from Foodgawker, man these look divine! 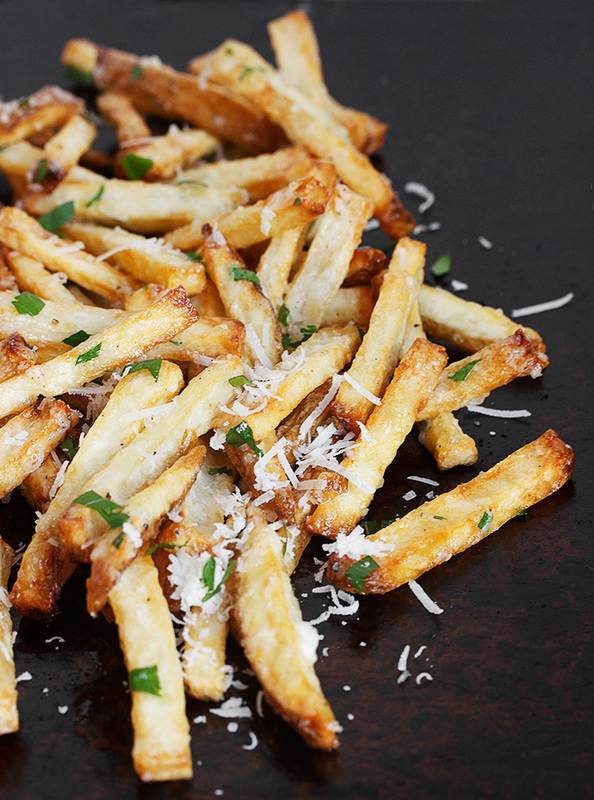 Fries are just awesome and with garlic and aioli – mind blown! My stomach is growling just thinking about these. Thanks Lana. They are delicious! These fries are just shouting “Eat me, I’m comfort food!”. Pinning this one for the weekend! Thanks Becca and thanks for pinning! First of all thanks for your wonderful site! 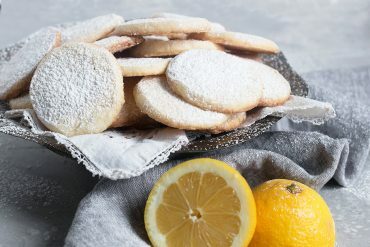 I have a small boutique hotel in Andalusia (Southern Spain) and we cook everything from scratch, so I am always looking for new recipes like yours! 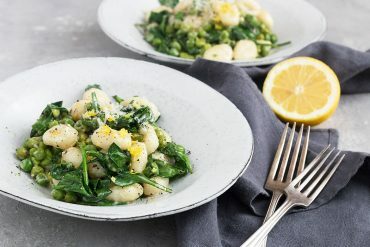 Just a hint on how to make super simple “cheater” alioli from scratch: 1 garlic clove, 3/4 cup milk, corn oil or similar (NOT olive oil) , a good pinch of salt, a bit of lemon juice. With a mixer mix the garlic clove, the milk, the salt and the lemon. Bit by bit add the oil until you get a mayonaise texture! 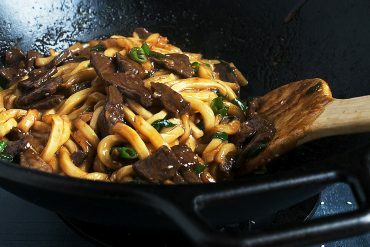 Super simple and no eggs (so doesn´t spoil easy!). This is the technique most restaurants here in Spain use to make alioli! Greetings from warm and sunny Andalusia! This looks delicious – would love to know the type/brand of fries that you use and what method do you use to prepare them? Thanks. Hi Paige. I used (and almost always use) fresh-cut fries from white potatoes (or sometimes Yukon Gold). I soak the fresh-cut fries for 30 minutes in cold water and then dry thoroughly and toss in a bit of oil and salt. These were air fried in a Philips Airfryer! I love my air fryer. All the great fry goodness with a fraction of the oil! Definitely loving the simplicity of this. So delicious looking! Thanks Katrina. These were little flavour bombs for so little effort putting them together! I could go for a giant handful of these fries right about now! Pinned! Thanks Jessica and thanks for pinning! I’m now craving fries at 9:30 am, these look incredible! These look awesome and I would completely pig out. 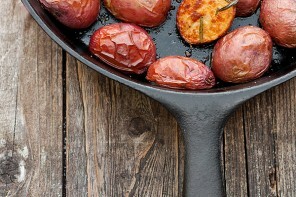 I love potatoes and between this recipe and your poutine recipe, I’m drooling! I would inhale the whole plate too! Love that you sister reports the nitty gritty details back to you so you can re-create dishes – that’s true love! You must try these, Karen. 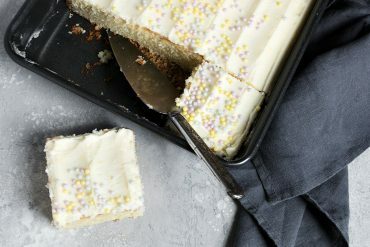 So simple, but a real treat!